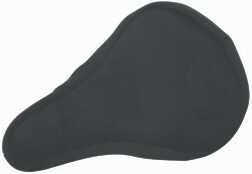 The Double Gel Seat Cover is an economical and easy way to add additional comfort to your existing saddle. 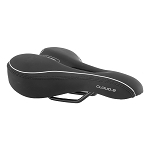 I ordered this pad for my son's bike (as we all know the new seats on bikes are not padded well), we ride bikes all the time and he has not complained of his tail bone of anything else hurting since this was put on his seat. Great seat cover!! It is well made and very durable!! I would recommend this cover to anyone who is looking for comfort while riding their bike!! I purchased to put on my spin bike seat and it fit perfectly, good quality and price.